31 May 2017 – A Bahraini court today approved the dissolution of Wa’ad (also known as the National Democratic Action Society), the country’s largest secular, leftist opposition group. Wa’ad was the last major opposition group officially operating in Bahrain following the July 2016 dissolution of Al-Wefaq National Islamic Society. 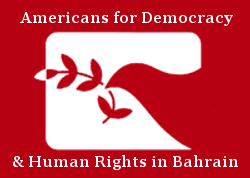 Americans for Democracy & Human Rights in Bahrain (ADHRB) unequivocally condemns this decision and calls on the Government of Bahrain to immediately reverse its assault on peaceful political opposition in the kingdom. The Ministry of Justice and Islamic Affairs (MoJ) launched dissolution proceedings against Wa’ad on 6 March 2017, citing unsubstantiated allegations of “incitement of acts of terrorism and promoting violent and forceful overthrow of the political regime” after the society issued a statement describing Bahrain as experiencing a “constitutional political crisis.” The MoJ’s accusations also reportedly concerned Wa’ad’s description of the three individuals executed by the government in January 2017 – who were tortured into providing false confessions – as “martyrs.” The proceedings were postponed so that Wa’ad could provide additional documentation, particularly concerning the unconstitutionality of the Law on Political Societies, but today a court ruled to dissolve the organization and seize its assets. Wa’ad is reportedly set to appeal the decision. The government dissolved another opposition political group, Amal, also known as the Islamic Action Society, in 2012. This is also not the first time that Bahraini authorities have targeted Wa’ad and its members. The society’s headquarters was twice burnt down and it has repeatedly faced suspension or threats thereof. Bahraini authorities have continuously subjected its former Secretary-General, Ebrahim Sharif, to various forms of judicial harassment. On 20 March 2017, officials charged Sharif with “inciting hatred against the regime” and against “factions of society” under articles 165 and 172 of Bahrain’s penal code for messages he wrote on social media. Sharif was previously imprisoned from 2011 to 2015, and then again from 2015 to 2016 on similar charges stemming from his involvement in the pro-democracy movement and speeches he delivered. He could now face up to three more years in prison. With the dissolution of Wa’ad, the Government of Bahrain has virtually closed all space for formal political opposition. ADHRB is extremely disturbed by this decision and calls on the appeals court to strike down the ruling. We additionally call on the Government of Bahrain to immediately and unconditionally release all political prisoners, reinstate dissolved opposition groups including Wa’ad and Al-Wefaq, and lift all restrictions on free expression, association, and assembly.